The new altar frontal was needed by The Royal School to reflect the wonderful colours in the chapel’s new window. Liz Holbird produced an old frontal that had been at the school for many years. The existing damask on which the gold cross was laid had become worn and there were lots of holes. 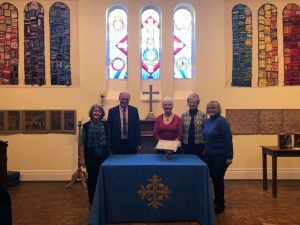 Barbara lifted the cross, which needed extensive repair, and re-stitched it on to the new blue damask, donated by The Arts Society, Grayshott. The blue damask now beautifully reflects the colours in The Queen’ Anniversary Window*. The frontal is lined with ivory damask, again donated by The Arts Society, Grayshott. This makes the frontal reversible. The new frontal was dedicated at the service to mark the first day of the new school term, on 9 January 2019 by The Rev. Dr. John Strain. The Sovereign has always been Patron of The Royal School, founded in 1840 by Naval Officers, who after winning the Napoleonic wars, wished to see their daughters and sisters educated to be independent women. Queen Victoria was the first Patron, and it was known then as The Royal Naval School, the badge of which appears in the top right hand corner of the window with its billowing sails set into a crown. The badge at the bottom right hand corner is of the Grove School (founded in 1858) which merged with the Royal Naval School in 1995 to become The Royal School. Its emblem appears at the bottom left hand corner of the window. In the top left hand corner is the badge of HMS Diamond. The school became affiliated with this ship in 2016. If you look at the window, a diamond shape has been created across the three panels of the window. The window was dedicated on 4 January 2018, by the Rt. Rev. Jo Bailey Wells, Suffragan Bishop of Dorking.